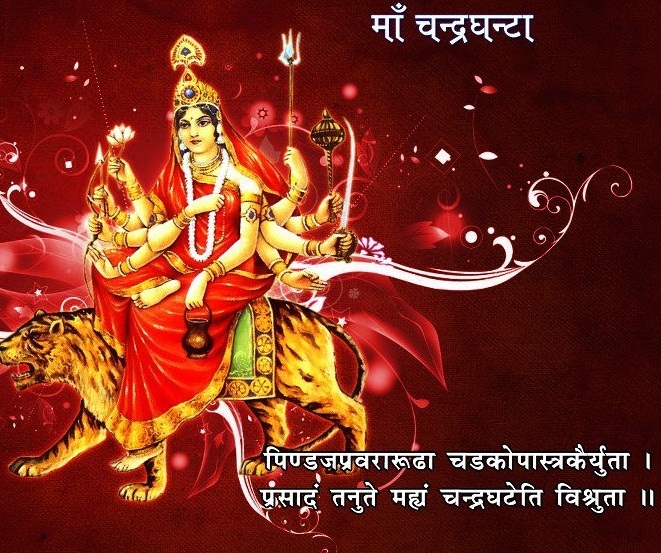 Maa Chandraghanta is the third Shakti of Maa Durga. Maa Chandraghanta is worshiped on the third day of Navrti Pooja. Those who worship Devi Chandraghanta get eternal strength and be blessed by Devi Maa to be happy through out one’s life. Maa Chandraghanta is one Who establishes justice and wears crescent moon on Her head. Because of this bell shaped mark of moon which is present on the fore head of Maa Chandraghanta, Maa is known as Chandraghanta. The colour of her body is golden, she rides on lion who descrides “dharma”, possesses ten hands and three eyes, eight of Her hands display weapons while the remaining two are respectively in the mudras of gestures of boon giving and stopping harm. Devi Maa is posed as to be ready for war. “Chandra Ghanta” meaning supreme bliss and knowledge, showering peace and serenity, like cool breeze in a moonlit night. By her blessings all the hindrances coming in way of a person are removed. Her pleasant looks clears all sorrows and sadness of her devotees. Her roaring voice alerts and makes the Demons to tremble. The third day of Navratri is very important in Navaratri. This day the mind of the sadhak enters Manipura Cakra. At this stage by the grace of Maa Chandraghanta he becomes capable of seeing unearthly and divine things. He smells the divine fragrance and many types of divine sound become audible to him. On this day and in this stage of discipline the sadhak is required to be most careful. By the grace of Mother Chandraghanta all sins of the sadhak (striver) are burnt up and obstacles removed. Her worship is instantly fruitful. She is always in a gesture as if ready to proceed for the battlefield and thus she removes the difficulties of devotees very promptly. Her vehicle is lion and so her worshiper becomes valorous and fearless like a lion. The sound of her bell always protects her devotees from evil spirits. As soon as the sadhak invokes her, her bell immediately becomes active and starts ringing to protect the devotee under her shelter. Even though she keeps her always busy in killing and suppressing the wicked, yet to her devotees and worshipers she looks most serene, gentle and peaceful. A very good quality that is developed in her devotees who worship her, is-the striver cultivates bravery and fearlessness accompanied by serenity and humility. His face, eyes and the entire body gets effulgent. His voice becomes divinely sweet. Wherever the devotee worshiper of mother Chandraghanta go, they disperse peace and blessings among the people. From the body of such a striver there always takes place an invisible radiation of divinely lighted atoms. This divine action is beyond the perceiving capacity of physical eyes but the striver himself and his associates go on experiencing this fact every now and then. By purifying his mind, words, deeds and body through prescribed manner we should worship the mother Chandraghanta and take shelter under her feet. Through worshiping her we can get rid of all worldly sorrows, and attain the supreme goal spontaneously. We should always try to advance on the path of spiritual discipline by contemplating on the sacred image of the mother. Contemplating on her, we can attain the mundane perfection and ultimate good in the other world. Last edited by Sonia Sidhu : 09-27-2014 at 05:45 PM. इन दिनों नवरात्र व्रत चल रहे हैं और इन पावन दिनों में मां भगवती की पूजा अर्चना का बेहद विशेष फल मिलता है. जो भक्त इन दिनों मां की सच्चे मन से पूजा करता है मां उसके कष्ट अवश्य दूर करती हैं. आज नवरात्र का तीसरा दिन है. नवरात्र के तासरे दिन मां चंद्रघंटा की पूजा करने का विधान है.